Brian House and staff was a very friendly and sincere to all my family’s wants, when we held my grandmothers funeral there. They where very professional and will work with you on just about anything. I couldn’t ask for a better place to have her service at. Thanks a lot Brian House and Laurel Funeral Home. Brian House did an amazing job handling our Uncle’s funeral. He is professional yet compassionate at the same time. Cant’t say enough good things about how he handles such a difficult situation for most families. Yes, my family & I do recommend Laurel Funeral Home. We had a great experience here! Thank you Laurel Funeral Home staff & Mr. Brian House. Thank you Brian House and staff. My entire family appreciates everything. I highly recommend Laurel Funeral Home. I was truly pleased with the services provided for my brother David Campbell. I would highly recommend Laurel Funeral Home. 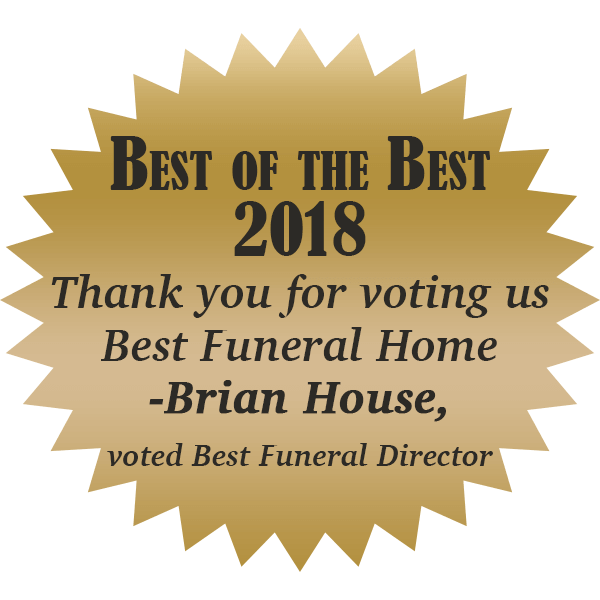 Brian House is a caring and very helpful funeral director. Thank you for your kindness, compassion and attention to the littlest of details. Owner, Brian House was very kind in our very stressful state. You could never prepare enough for the passing of our loved one, Terrence Jackson. Brian and staff said “We’ll take care of him as if he’s our own”! That was a relief just to hear those words during that time. Our grandmother passed away recently. We could not have asked for anything better than laurel funeral home for her services. Brian House was so compassionate and helpful. The staff overall were the best. Felt like a personal touch and never did they once say no for anything we asked. They accomodated us very well. The funeral home itself is clean and very nice. Keep up the great work Brian and team!! We could not have asked for a better funeral home for our dad than Laurel Funeral Home. We can't thank you enough Brian, for the excellent service and compassion we experienced. I would highly recommend this funeral home to everyone. Very compassionate and understanding. Our family couldn't have asked for better! Thank you to everyone at Laurel Funeral Home. I would like to thank Brian House for his kindness and support, while dealing with the loss of my brother, Joseph Edward McHarge. I would recommend Laurel Funeral Home to anyone who is in need of funeral services. He went above and beyond assisting us during such a painful time in our lives. I pray the Lord will favor you for the kindness, honesty, and professional way you helped our family. We sadly just lost our brother, Robert Russell, who lived in Corbin, KY. We reside in NC so really had no idea where to turn. I’m sure glad we chose Laurel Funeral Home! Very compassionate, honest and never placed pressure on us or tried to upsell us on anything. Allowed us to do things the way we wanted too in honor of our brother. Thank you Brian for making this tragic time a little more bearable. Hopefully, I will not need a funeral home in this area again, but if I do - I am definitely calling Laurel Funeral Home! Brian Is a true professional very compassionate! I just wish more people knew how great Brian & the folks are at Laurel Funeral Home. Our mother passed away unexpectly and we were shocked but called Brian he came to our aid and never left us thru the whole process . We will never forget you Brian ! My mother, Maxine Helton passed away in May her arrangements had already been made by her through Corbin funeral home which now is laurel now in Corbin. Knowing nothing since she lived in ohio on what to do . I talked to Brian at Laurel what a godsend Corbin you should really be proud of this man. He helped me handle everything from Corbin to Cincinnati.He showed respect all the way,advised the best way to handle her passing. When you are greveing your loved ones passing you are gullible to people you only want the best this man keeps you real with how he handles things never takes advantage of you i can't say enough about the honesty of this man. My grandmother, LaVerne Hurst passed away unexpectedly and Brian House went above and beyond to make her funeral exactly how we wanted. I would recommend Laurel Funeral Home to anyone. Thank you for everything. We really appreciate the kindness and professionalism from everyone at Laurel Funeral Home during the difficult time of our Mother’s death. The family of Nina Bargo. I would like to thank the people at the Laurel Funeral home. They did a marvelous job with my mother, Barbara McCormick. I couldn't have ask for better service and a friendlier group of people. Brian House and all the employees were beyond great. They were the only funeral home around that would even consider taking my uncle Noah Taylor once he passed unexpectedly! Brian drove all the way to Lexington to pick him up not even knowing if we would be able to pay for his funeral. They worked with us all the way through everything with care and courtesy. We could not of chosen a more caring place then Laurel Funeral Home. Brian House was very caring from the moment we meet him and did a great job with everything. He was very helpful with all our needs during this time. Thank you for everything! I love the new owners! They are really nice people and the staff was great and friendly! Very clean place! They treat you like family! I would recommend this place to anyone! They meet every need above and beyond for our family! They where excellent! Just wanna say thank you to Brian House and his staff for the for the wonderful experience and great hospitality that they showed us during our time of sorrow! We had an excellent and caring experience from the staff of Laurel Funeral Home. They took very good care of my family during our time of need. Thank you! The family of James Michael Hill. I would like to thank Brian and all of the staff at Laurel Funeral Home. Everything was taken care of for my Dad, Jimmy Napier with a gracious attitude, yet professional. Everything looked amazing! These are great people to work with during such a trying time. Thank you so much! The Laurel Funeral Home, Brian House in particular, made our tough day slightly easier. The service was flawless and we were allowed to create a Star Wars theme funeral fit for a Jedi for my cousin Alex Gray. Many thanks to those who helped create a memorable day. Now Brian since you are selling monuments you have all the services that any family would want or need! Could I also add, lower price options & that personal touch that is often lacking within the Tri County area! The services can be arranged at home or the funeral home and held in a local church for visitation/funeral & family convenience! Laurel Funeral Home did such a wonderful job in conducting the service for my Dad and caring for my family during this difficult time of loss. Everyone was kind and helpful. Thank you so much! What can I say that's not been said. You made a difficult time not so difficult. I feel like you are a best friend. Thank you for your kindness, compassion, attention to details and yes your sense of humor. I found that very refreshing. Thank you Brian! Just a little while ago, my precious father left this life and went on to a much better place than this world. Since my mother had already passed years before and I was an only child, the cost of the funeral fell into my hands. Laurel Funeral Home and Brian House were the only ones in the area that didn't just want to take advantage of my vulnerable state with outrageous costs. They provided the best service at an affordable price. I'm glad that not every funeral home in Laurel County seeks to use a broken-hearted family to feed their money hungry pockets!! I wanna say thank you to Brian House, he worked with us anyway he could when I lost my mom, Doris Brewer. He was very respectable and kind, very friendly and never tried to rush us with anything. He would sit right their and go over everything with us ,he will bend over backwards to give your loved one a very nice funeral and I would recommend Laurel Funeral Home anytime! Brian House helped me pre-arrange a funeral. I am so glad to have that done and out of the way. These people are so professional and kind. Thank you Brian for your kindness and compassion. I would also like to thank you for the kindness and respect you showed my family and friends that came to the planning. You took the worry from me and I know things will be handled properly when the time comes. My mama (Ruby Napier) passed away and it was the hardest thing ever seeing Brian carry her out of her home but he was so good with her and gave us as much time as we needed and made sure she was just like her picture I brought in for him to do her hair etc she was so beautiful and he took care of each and everyone of us making us all feel as comfortable as he possibly could I would use this funeral home again if need be . My mama was so much more to me than most people realize but Brian him self kept checking on me I appreciate that the most from him . I highly, highly recommend anyone that needs the services of a Funeral Home to please contact/use Laurel Funeral Home. I was treated better than a family member and was tremendously, well pleased with the services they provided for me. Everything was conducted very professional and very courteous. I am extremely satisfied with Laurel Funeral Home. I would like to express my GREATEST THANKS to Brian House. Words can not express my thanks to Brian for everything he/Laurel Funeral Home did in providing their services for me in my great time of need. Please contact Laurel Funeral Home for any needs you will have. When there is a death of a loved one it is never easy on anyone. My father passed away a little over 2 weeks ago. Thank you Laurel Funeral Home and Brian House for your kindness to me and my family during this difficult time. We never wanted to make these arrangements but thank you Laurel Funeral Home for listening to us, your patience and providing the service we felt my father deserved. We came to know this funeral home by choosing to set up mine and my wife's funeral arrangements there because of a advertisement we seen in the paper. What their advertisement say's is true "You may come through our doors as stranger, but you will leave as family!" They made us feel like family! Such a good group of people and their prices cant be beat! When our Uncle Pete died we had heard our friends where all at Laurel Funeral home. We have known those guys a very long time. We had tried other funeral homes because the funeral home we always used in the past had changed so much and we didn't like it our family has had a few deaths recently but they just wasn't up to what we where used to. They seem to just throw it all together. But we where glad we called Sam, Vernon and Brian. They are our friends and they know how we like things to go! Using this funeral home is well worth the drive from London just to have funeral people you know. Its not that far anyways. Great job guys!! Very pleased with the service I was provided with at laurel funeral home with my dads passing. Brian House done an excellent job with assisting in everything and making a stressful and sad time a bit easier. Definitely recommended!! Thanks to all that was involved with my great Nephew, as we all know a death of a child can be very overwhelming but the staff make everyone as comfortable as possible. Thank you all so much. was extremely pleased with the services that Laurel Funeral home provided during the loss of my dad. It is beautiful inside, and Brian House and the staff done an excellent job with everything. Brian House gave perfect recommendations and I could not have been more satisfied with the services. Thank you to Brian House and the staff. My family and I are so grateful and I can not thank you enough. We had several compliments on how well everything was done. Again Thank you so much! Brian House and Staff did great during the loss of our dad. The funeral was beautiful and we are so blessed and thankful to have chosen Laurel Funeral Home. They did wonderful taken care of dad and our family. Thank you Brian House and Staff!! Brian House was exceptionally caring and very responsive to our wishes in the planning of our dear Mother's funeral! No one will treat you better! He's the best funeral director!!! Thank you for helping my husband and I through the prearrangement funeral process. You have been so kind, compassionate, understanding and patient as we worked on each step of this process. In the rush of life and in business, people who are personable and friendly are sometimes hard to find. You have both of these qualities! Thank you for helping us! This place is a 1st class professional, we are proud to be doing business together. I thought laurel funeral home did an awesome job burying my dad yesterday.couldn't have ask for any better service.I highly recommend them.I know they'll always be our family's first choice.SO A SPECIAL THANKS!!! Brian House and entire staff, I will never forget your caring touch. Thank you, you definitely went above and beyond to comfort me and my entire family. Thank you from the bottom of my heart. What an incredible funeral director you are Brian. U were AWESOME during the passing of my mother. I'll NEVER forget it! Brian House and his staff was amazing. They went above and beyond. They were compassionate for us and treated my mother as if it was theirs they took really good care of her and made our day a little more comforting. Thank you so much. am so appreciative of The Laurel Funeral Home and Brian House. He went out of his way to make sure our needs were met. Brian House, the staff, and the Laurel Funeral home did an outstanding job with the care of our mother, Bonnie Rose. She looked beautiful! Thanks Brian for your dedication and service to families in their time of grief. We were so very pleased with Brian House, Laurel Funeral Home, and staff. They went above and beyond with our Mother, Bonnie Rose's visitation, funeral, and burial. The minute attention to details made our family feel special. I would highly recommend Brian House and Laurel Funeral Home. Brian was very helpful and very professional. Went about the call of duty with extras he did with our mom Bonnie Rose. I would highly recommend this funeral home to everyone. We would like to thank Laurel Funeral Home for a great job on handling the funeral service's for our son Eric Johnson. We have known the staff for years and have trusted them in the past with the care of our loved ones but only at a different location. That is why we chose this funeral home. We have known the staff for years and we knew they could handle our every request. That makes a big difference when trusting someone with the care of a loved one. They handled everything from the first call to the very end with such care, professionalism, dignity and respect. They have a beautiful facility but we chose to have our son's services at our church here in London. We couldn't have asked for anything better!! We highly recommend this funeral home. We want to thank them for taking such great care of us and our son. Glad to hear they were able to hire Brian House. He is a great, caring director and was such a blessing to the people when he worked here in London, KY. I'm glad he is still close by!